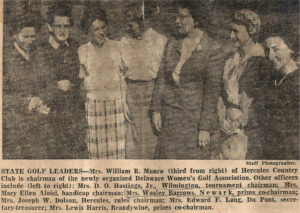 Back in the day, in 1952 to be exact, a group of local Delaware women headed up the Delaware Women’s Golf Association (DWGA). Seven enthusiastic ladies with a passion for the game of golf served as the initial officers of the DWGA. Golf for women back in the 50s was much like it is today. Fun, relaxing days on some of the most prestigious courses awaited the members of DWGA but not without competition and rivalry. DWGA sponsored the first tournament in Delaware to crown a women’s champion of the state. The tournament was held at the Brandywine Country Club. The match play tournament was back and forth between two close rivals, Mrs. William Geddes, Newark Country Club, and Mrs. J. Walker Hoopes, Wilmington Country Club. Mrs. Hoopes, a former National senior champion, was favored to take the laurels, but Mrs. Geddes proved the more consistent performer. Mrs Geddes closed out the victory on the 17th hole, three strokes in front of her rival, and was crowned the 1952 Delaware State Women’s Golf Champion. At days’ end, the tournament was an all-Wilmington Country Club affair. Mrs. Hugh Nicolson of Wilmington Country Club grabbed medalist honors finishing 3 strokes in front of her closest rival, Mrs. Norman M. Lack also of Wilmington Country Club.